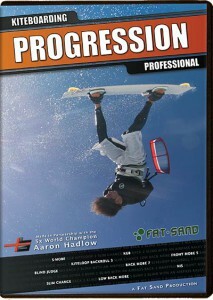 Once you’ve mastered the kitesurfing basics, there is an amazing array of tricks and techniques that will keep you loving every aspect for kitesurfing for years to come – Progression Kiteboarding Intermediate Volume 1, is here to make sure you get the most out of your time on the water, whatever the conditions, whatever tricks you want to learn & whatever equipment you choose to ride. Toeside riding – looking at your technique both sliding round to toeside, but also ensuring you can keep your speed up, control the power and ride along effortlessly. Carving turns – here we’ll help you manage the critical synchronisation of your board and kite movement, starting with Toeside to Heelside carves, and then on to Heelside to Toeside. 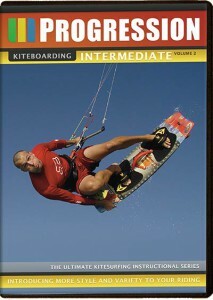 Jumping – Probably the most popular and fundamental trick in kitesurfing and the Intermediate Volume 1 DVD will cover all aspects of this in vast details. We start with small jumps, minimising the kite movement, and here we have a vast array of common mistakes to help you diagnose your individual problems. Then its on to increasing your height and boosting big airs. A completely new addition is an introduction to popping. Leaving your kite parked and understanding how to edge to generate lift, another key skill that will open the door to so much more in the future. Lightwind Riding – we all have to kite in lighter winds as some point and if you want to avoid frustration and make the most of the conditions then technique is crucial. 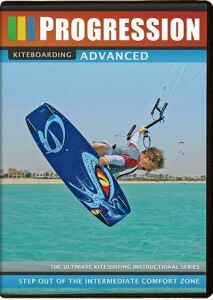 Wonder why you feel really powered up, in lightwinds, but can’t stay upwind? You want to watch our segment on the theory of apparent wind. Strong winds – When it blows hard you can get intimidating by the consequences of your actions but with out 4 strong wind tips we’ll give you the control to start relishing some of the most fun conditions kitesurfing has to offer. Coping with Waves – Though you may have learnt in flat water, plenty of locations throw up some daunting waves that stands between you and a great session. Learn how to survive and get out through the breakers. Tuning your kit – Modern kites will generally work well straight out of the bag, but there are small adjustments that can be made to change the flying characteristics of some kites or the way your bar works. And over time you may find your lines need to be adjusted, both to tune your kite but also to fix some problems – something that can be a headache, so we cover it all in detail, so you’ll come to fully understand how your lines interact with the kite and bar. Each chapter is built around our established Progression Method, which has proved successful over the past 7 years and 7 Progression DVDs. Detailed technique breakdown, common problem analysis, split screens, slow motion repeats and graphic overlays – all proven at aiding faster development. 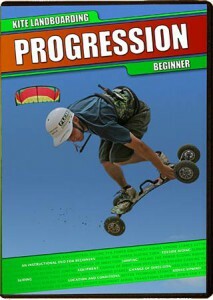 This is an exciting time in your kitesurfing progression, so do yourself a favour and waste no time struggling to understand what you are doing wrong, get a copy of the Progression Kiteboarding Intermediate Volume 1 DVD, soak up some ideas and then get out there and give it ago! ‘Zones’ of free kite content!